The decrease stitch will always lean to the right or left depending on the type of decrease you use. To make a left leaning decrease, we will use slip, knit, pass over. To do this, insert the right-hand needle into the first stitch and slip it to the right-hand needle without knitting it. With the tip of the left-hand needle pass the slipped stitch over the second stitch.You’ve now worked a decrease and have one less stitch. Continue working the rest of the row. In this case, we have worked the sample in stockinette stitch, so the row is knitted.On the wrong side rows, purl all stitches. At the start of each odd row, repeat the previous steps until you decrease as many stitches as you want.Now we are going to make a decrease by knitting two stitches together.In this case, the stitches will lean to the right, so we will make the decrease at the end of the row.Insert the right-hand needle through the next two stitches on the left-hand needle and knit them as if they it was a normal stitch.Remember to make this decrease on the right side of your work. After you have finished the row, turn your work, and purl the next row. 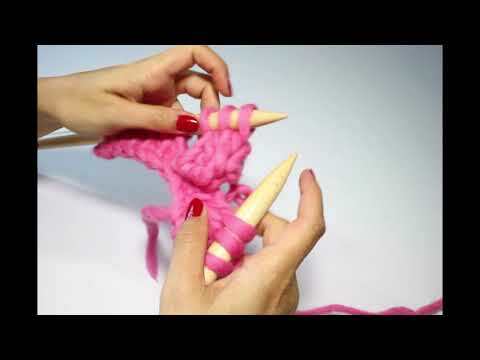 Turn and continue knitting. In this case, we've made the decreases at the beginning or end of the work, but you can use them wherever you want to depending upon the design or as indicated in the pattern.Make a new decrease by knitting two stitches together.Insert the needle through the next two stitches and knit a stitch.You will see how the decrease at the end of the row leans to the right.Repeat and knit as many decreases as you need. Ideally, you should combine the two methods of decreasing in the same row: SSK or SKPO on the right side of the work and knit two together on the left side so that the edges are more symmetrical.